In a medium saucepan, bring pears, lemon juice and zest, sugar, corn syrup, vanilla seeds and vanilla pod to a boil. Reduce heat and simmer for about 15 minutes or until pears are soft and most of the liquid is reduced. Remove from heat and let cool slightly. Remove vanilla pod and discard. While fruit is cooling mix together Real California cream cheese and salt in a small bowl and set aside. Mix cornstarch with about 2 tablespoons of the Real California buttermilk to make a paste and set aside. Puree pear mixture in a blender or food processor until smooth. Pour Real California heavy cream and vanilla extract into a medium saucepan and bring to a simmer. Add pear-lemon mixture and continue to simmer. Add cornstarch paste and stir well to combine and return to a simmer. Add remainder of the Real California buttermilk and simmer for another minute just until mixture thickens. Remove from heat and stir the Real California cream cheese and salt into the hot liquid. Set aside to cool. When mixture is cool enough to handle, pour into a sealable plastic bag and place the bag in a large bowl of ice to cool down to room temperature (about 30 minutes). You can also cool the mixture in the refrigerator but it will take longer. 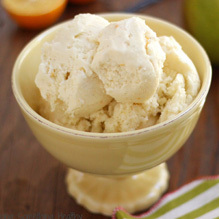 When pear-cream is cool, pour into an ice cream maker and churn for 20-30 minutes until desired consistency is achieved. Store any leftovers in an airtight container.